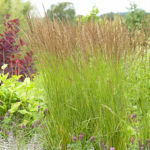 Using native grasses and sedges in the landscape offers an array of important ecosystem benefits and can greatly improve the wildlife diversity in your garden. Native grasses serve as larval host plants in the lifecycle of many butterflies, moths and skippers. 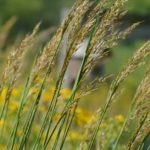 The foliage, structure and clumping bases of native grasses provide essential habitat — shelter, winter cover and nesting areas — for various butterflies, moths and beneficial insects such as bumblebees and beetles as well as small amphibians and reptiles. Many birds and small mammals feed on grass seeds during the lean fall and winter months. 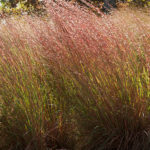 Native grasses also provide year-round visual interest in landscapes. Individual specimens can act as structural focal points, while inter-planted or grouped grasses can form a supporting matrix for other plants. 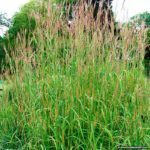 Owing to their extensive root systems, native grasses are drought tolerant, require little care, stabilize the soil, can effectively absorb and filter rainwater run-off, and can serve as groundcover to displace weeds or even replace lawn turf. Attractive small clump-forming perennial grass with unique, showy flowers. Fine, blue-gray foliage turns a nice golden brown with orange-red hues in fall. Upright clumps, 36-72″ tall, of slender, blue-green leaves turn golden yellow in fall. Stiff, vertical flowering stems, topped with 12″ long, narrow, light brown flower panicles with yellow stamens, rise well above the foliage in late summer. 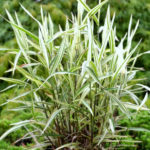 Narrow, upright, grassy foliage makes a great vertical accent for a border, rock garden or container. Emerges blue, develops pink and burgundy hues in late summer, and turns a rich copper in fall. Slender stems rise up with purplish panicles. Tan seed heads persist into fall. Perfect for bird friendly landscapes. Upright clumps of bamboolike foliage. Green leaves turn copper in fall and brown in winter. Attractive flat flower spikes hang down from stems. Prefers light shade and damp soil. Can self-sow prolifically. Also known as wood oats and river oats. Caterpillars of Northern Pearly Eye butterfly, two skippers and a moth feed on it. 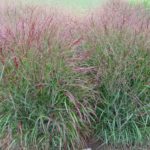 A fine-textured grass for the landscape with tall, slender stalks that display airy, remarkably fragrant, light brown, late summer panicles. Dense, mounded foliage turns deep copper-gold in fall. Attractive accent, or easy care groundcover, if planted in mass. Long-lived and trouble free. Rarely self-seeds. 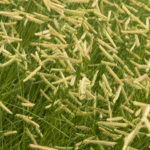 A clump-forming, columnar, warm season grass that grows 3 ft. tall with flower heads rising 3 ft. above the foliage. Medium green leaves turn yellow, sometimes with orange tints, in autumn, fading to tan in winter. Foliage is topped in mid-summer by finely-textured, pink-tinged, branched flower heads. Flower heads turn beige in fall with the seed plumes persisting well into winter.